Salé (Berber: Sla / Sala, Arabic: سلا‎; frae the Berber wird asla, meanin "rock") is a ceety in north wast o Morocco. It is an aa the auldest ceety in the Atlantic coast, as it wis foondit bi the Phoenicians an wis kent back then as Sala (modren challah); it wis completit syne then frae the ither side o the river o bou regreg bi the Banu Ifren dynasty. During the 17t century, Rabat wis kent as New Salé, or Salé la neuve (in French) which explains Salé as the auldest ceety on the river. The day it is hame tae approximately 800,000 fowk, maistly impoverished factory wirkers. It wis ance a sel-contained, sel-ruled Republic wi internaitional scope, situatit on the mooth o the Bou Regreg river on the Atlantic coast. The ceety's name is whiles transliteratit as Salli or Sallee. 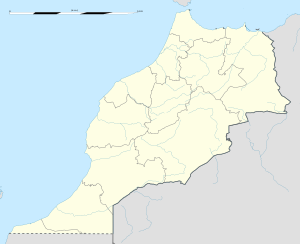 The Naitional Route 6 connects it tae Fes an Meknes in the east, eventually leadin tae Maghnia, Algerie. Salé wis apparently colonised bi the Phoenicians at approximately the same time that Chellah, athort the Bou Regreg tae the sooth. Researchers ken a considerable amoont aboot the Chellah colony, probably thanks tae the guid state o preservation o the Chellah site. Salé... dates back at least to Carthaginian times (around 7th century BC). The Romans called the place Sala Colonia, part of their province of Mauritania Tingitane. Pliny the Elder mentions it (as a desert town infested with elephants!). The Vandals captured the area in the 5th century AD and left behind a number of blonde, blue-eyed Berbers. The Arabs (7th century) kept the old name and believed it derived from "Sala" (sic., his name is actually Salah), son of Ham, son of Noah; they said that Salé was the first city ever built by the Berbers. In the 17t century, Salé became a haven for Moriscos-turned-Barbary pirates. Salé pirates (the well-kent "Salè Rovers") roamed the seas as far as the shores o the Americas, bringin back luit an slaves. Thay formed the Republic o Salè. Thare is an American faimily, van Salee, descendit frae a Salé Rover, Jan Janszoon. The ceety o Salé wis bombardit bi the French Admiral Isaac de Razilly on 20 Julie 1629 wi a fleet componed o the ships Licorne, Saint-Louis, Griffon, Catherine, Hambourg, Sainte-Anne, Saint-Jean. He bombardit the ceety an destroyed 3 corsair ships. Salé haes acquired its title o nobility durin the French protectorate. Durin the decades precedin unthirldom o Morocco, the ceety wis the stranghauld o naitional resistance movements. The caw tae "latif" launcht in Sale, relayed in the main ceeties o Morocco, an the petition against the Berber Dahir gien tae Sultan Mohammed V an Resident General o Fraunce will lead tae the athdrawal o the Dahir o Mey 1930, collectit bi intellectuals o the time as an attempt tae divide the Moroccan fowk. This text haes led toae the first reaction Moroccan naitionalist elites against the occupier an devotit thair will tae resist. Mony admit nou that this episode wis the foondin act o poleetical awareness that wad lead fowerteen years later the signin o the Manifest o Unthirldom 11 Januar 1944 bi mony "Slaoui". Salé haes an aa been deemed tae hae been the stranghauld o the Moroccan left for mony decades, whaur mony leaders hae residit. Salé haes played a rich an important pairt in Moroccan history. The first demonstrations for unthirldom against the French, for example, spairked aff in Salé. A guid nummer o govrenment offeecials, decision makers an ryal advisers o Morocco wur born in Salé. Salé fowk, the Slawis, hae aaways haed a "tribal" sense o belangin, a sense o pride that developed intae a feelin o superiority towards the "berranis", i.e. Ootsiders. Modren Salé is a heichlie pollutit, badly planned, rapidly expandin toun acause o rural exodus. The ceety is nou a lairge "dormitory toun" wi little community life, devoid o a "centre" o its awn. Most o its influential an wealthy indwallers hae depairtit tae live in Rabat on the ither side o the river. Pheesical remnants o Salé's historical heritage are totally decrepit, pollution is prevalent an insecurity is heich. Housomeivver, baith its geographical situation an its "meltin pot" aspect mak it a toun wi a lot o potential that sae far remains untapped bi the local authorities. Recent developments, includin the new brig connectin tae Rabat, a new Sale-Rabat tram seestem, marina an coastal development, aw shaw that this is chyngin wi the govrenment an private development companies sic as Emaar Properties pourin money intae the aurie. Water supply an wastewater collection in Salé wis irregular, wi poorer an illegal hoosin units sufferin the heichest costs an maist acute scarcities. Muckle o the ceety uised tae rely upon communal staundpipes, which wis aften shut doun, deprivin some neighbourhuids o safe drinkin water for indefinite periods o time. Housomeiver, Salé fared better than inland Moroccan locations, whaur water scarcity is even mair acute. Recent improvements frae the govrenment, local business's an Redal haes meant that this situation haes improved drastically in recent times. Heich un-employment uised tae be a serious issue tae the Sale aurie wi mony textile factorys bein locatit in this aurie bein the anerlie real soorce o wirk, this is recently diversin intae ither auries sic as internaitional caw centres, electronics an recently a new "techno pairk" wis opened, which wis modeled on the Casablanca techno centre success. The A.S.S. is the fitbaa club o the ceety, an the preses is Abderrahmane Chokri. The film Black Hawk Down wis partially filmed in Salé, in parteecular the wide angle aerial shots wi helicopters flyin doun the coastline. The character Robinson Crusoe, in Daniel Defoe's novel bi the same name, spends time in captivity o the local pirates an at last sails aff tae leeberty frae the mooth o the Salé river. Wikimedia Commons haes media relatit tae Salé. ↑ Wilson, Peter (1995). Pirate Utopias: Moorish Corsairs & European Renegadoes. Autonomedia. ISBN 1570271585. This page wis last eeditit on 3 November 2018, at 05:08.